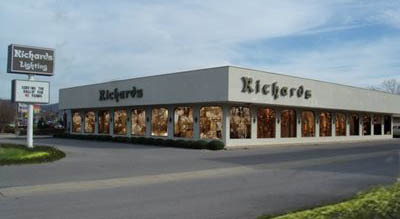 Richards Lighting has been serving the Tennessee Valley since 1963. Owned and operated by the Lapidus Family, our 30,000 sq. ft. facility contains a comprehensive selection of lighting accessories, covering all price ranges and style categories. Whether you’re looking for a single bulb or an entire house of lights, our staff is ready to assist you with all of your lighting needs. Whether in our showroom or at your job site, we’re prepared to discuss the best ways to meet your lighting needs. From developing or critiquing electrical plans, to walking through your home or garden selecting the best lighting applications, to recommending specific fixtures, we’re at your service. And, with four full time delivery vehicles on call, we’ll get your merchandise to you at your convenience.